How can we help? Click the image above to learn more. September 6, 2016, just happens to be “Protect Your Groundwater Day!” Created by the National Groundwater Association (NGWA), Protect Your Groundwater Day is a day for everyone to celebrate the importance of groundwater and the impact it has on our everyday lives. So just what is groundwater and why is it important to you and more specifically your business? Groundwater is the water found underground within the cracks and crevices of rocks and sand or within the soil. It is common to assume that there is an endless amount of groundwater/freshwater available to us, however only 1% of all the water on Earth is usable by humans. With that in mind, it is important for us not only to conserve water but also protect it from contaminants – especially when impacting groundwater from production can result in a costly cleanup project. Why should a business pay attention to groundwater? Like everyday people, industry is also dependent on groundwater. Groundwater provides about 18% of an industry’s fresh water (an economic value estimated at $2.7 billion), so the importance of clean groundwater to businesses is hard to overestimate. Inefficient use of groundwater costs money in terms of energy for pumping it and costs for treating and disposing of it after use. Likewise, accidental contamination of groundwater threatens a vital business resource. Many of our commercial and industrial clients only become aware of groundwater quality issues when they showed up in their own potable wells. When that happens, treatment of potable water becomes an additional expense on top of the environmental liabilities associated with remediation. What can you do to protect your groundwater? As noted on the NGWA website, you can protect groundwater by preventing its contamination by human activities and using it wisely. Complying with current State and Federal regulations on use and storage of chemicals, petroleum products and fertilizers goes a long way towards reducing the risk of groundwater contamination. Beyond legal requirements, it’s helpful to develop good housekeeping practices and a workplace culture that avoids shortcuts; especially with chemical handling. Water conservation is a vast topic, but it all starts with tracking your existing usage then developing practical and realistic goals for improvement. 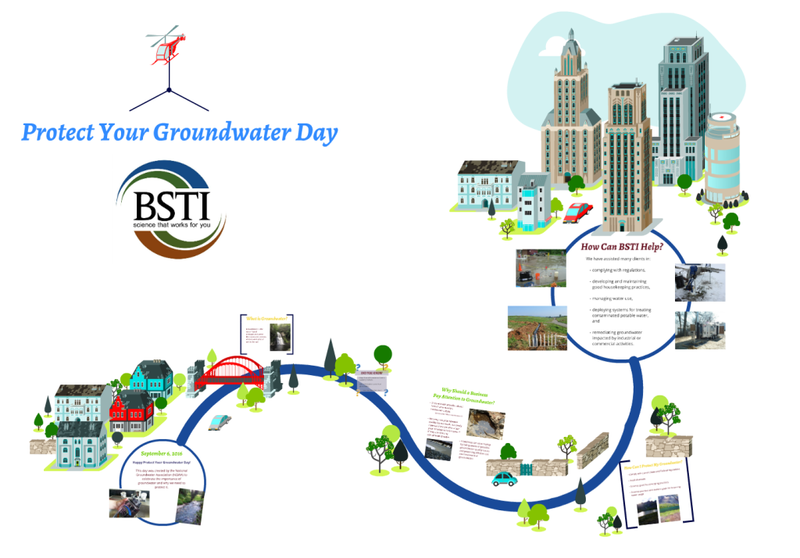 Happy Protect Your Groundwater Day!